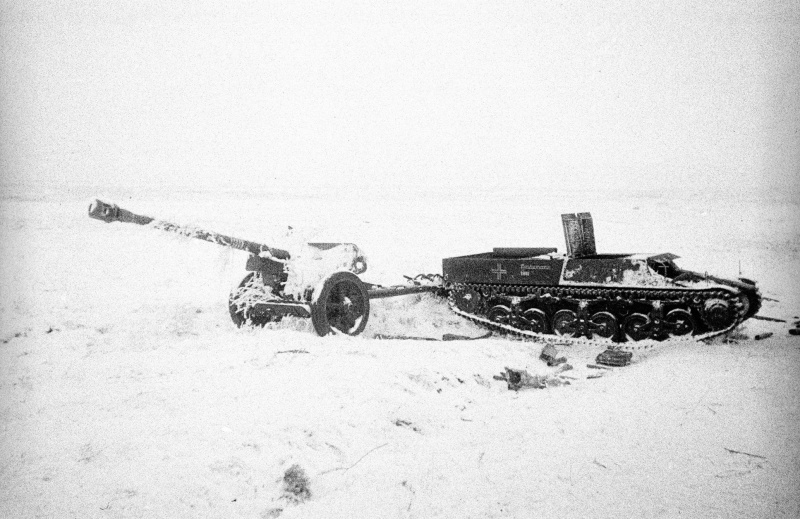 So I have seen pictures of Pak40's being towed by SdKfz 10, 11 or 251, RSO, Somua MCG and what looks like a Soviet T60 Light tank with turret removed. Anyone got any other suggestions for a tow? Fancy something unusual, so the Somua is top of my list at the moment. I've seen pics of re-enactors pulling them behind a kettenkrad, but I don't know how common that was. Maybe just for short-distance re-positioning of a gun? I can't imagine it would be practical as the prime mover. Exactly, the poor thing would be ringing its guts out. It was probably done to save manhandling, but I can't imagine the army approved. I seem to recall seeing one towed by an ex-French Somua half-track, that would look funky and different OR how about Shellhole Scenics cool R35 tow?? Thanks for the replies. Not seen the Lorraine pic before. Someone on TMP linked the Renault UE, but I am wondering if it is Romanian. Looks like the Cross of St Michael on the gun shield and also the back of the UE. It has the characteristic v shaped cutout on the arms of the cross, so not a Balkenkreuz. The crew look German though, at least their uniforms do. I have seen pictures of a Kettenkrad towing 2 Flak38’s and the Luftwaffe used them to tow planes too, but no room for crew or the ammo, so not very practical. Should have said this is for 28mm. No WW2 German limbers produced as yet. In fact not many limbers in 28mm post Napoleonics. Somua MCG and the Lorraine are both possibilities as Mad Bob makes them. A jalopied Soviet Light tank, T26, T60 or T70 I have thought of although this is for mid ‘44 so wondering if any T26 chassis still serviceable by then. Also wondered about a Munitionsschlepper 38t. Easy enough conversion. Take the turret off a Pz38t and replace with canvas tilt. Last edited by cartfc on Sat Oct 06, 2018 8:51 pm, edited 1 time in total. 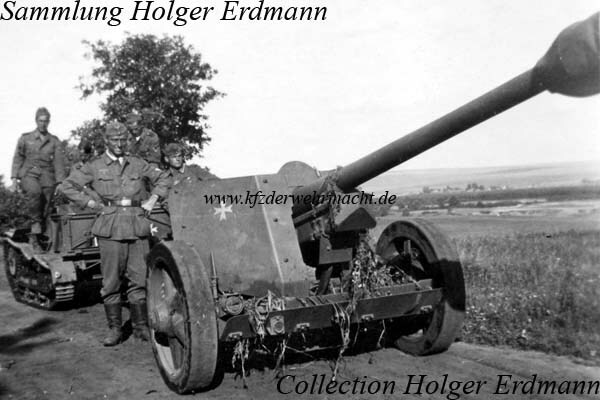 This is an interesting pic of a Kettenkrad and a 25pdr. Thought at first it was towing it, but on closer examination the gun trail looks too low, so probably just driving past it. It had an engine rated at 35hp. Not bad for WW2 and a light vehicle. It has about the same HP/ton as the Quad gun tractor, so seems quite a gutsy little machine. Done a bit more digging. If the UE can tow a Pak40 then so can a Kettenkrad. The UE was heavier and only had 3 more HP than the Kettenkrad. Probably quite rare outside of static divisions, though? Having enough MT to move the artillery around was one of the main things that distinguished a regular infantry division from a static one AFAIK.